This industrial strength Nitecore Gun Mount was designed to mount a flashlight or laser sight to your gun. It offers quick on and quick off with no rail or tools required. 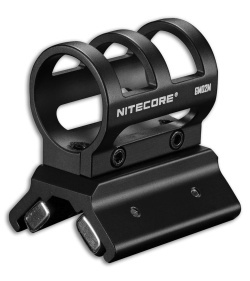 The mount is suitable for 1 inch diameter flashlights or laser sight tubes. It comes with various inserts that allow for mounting of items ranging from 23mm to 26mm in diameter. Item comes in a matte black finish.